Check In/Out: Check in is at 2 P.M. while Check out is at 11 A.M. In the event that a late check in (after 10 P.M.) is required it must be made known to the front desk prior to your stay. Additional Charges:All room prices are based on double occupancy, there will be a $10.00 charge for each additional adults. Children under age 10 are free. Pets must be claimed at check in and a $15.00 per pet, per night. You must claim your pet at check in. Owners are responsible for any damages, or injury your pet may cause and the owner will be charged accordingly. All pets must be on a leash at all times. Pet can not be left alone in guest room. Cancellation Policy: Cancellation is 48 hours in advance. Parties reserving five or more rooms must give 72 hours advance notice. If these parameters are not met, then 1 nights stay will be deducted from your credit card. When booking this room you are just holding the room with your credit card. You will be billed at time of arrival to Marianna Inn. Please have a valid ID and Credit Card in the name of the Booking person ready to present to front desk. You will be charged then (If you fail to provide proof of who you are, card is invalid, no I.D., a no show, or do not cancel your reservation in the allotted time, you will be charged 1 full night). Please Note: Owner reserves the right to refuse service to anyone and cancel a reservation due to technical difficulties, internet, or system malfunction beyond our control causing over-booking. We value each and everyone of our guest and will work hard to accommodate you with a room on the day requested for the daily rate when available. If your reservation was made from a third party e.g. Expedia, Booking.com, etc... you must cancel through that third party. If you are calling to cancel, you must receive a cancellation number. Deposit Policy: Please return your keys when checking out. If you do not return your key a $25.00 fee will be deducted from your credit card. By reserving this room on line you are giving us your electronic signature that you agree to all the terms and conditions specified. 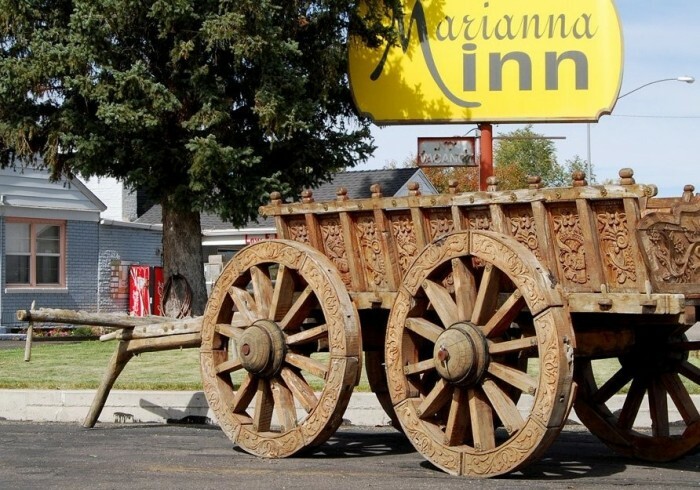 The Marianna Inn is located right on US Highway 89 which is as old as Route 66 and much older than numerous interstate freeways. US Highway 89 is recently recognized by US congress and US senate as US Heritage Highway 89. Marianna Inn is the best place to enjoy Scenic Route #12 and Back Road #143. The Marianna Inn is the perfect lodging to enjoy Bryce Canyon National Park, Zion National Park and much more. Marianna Inn is conveniently located within 30 minutes to an hour from all the major national parks. You will discover some of the best Out Door Sports in Utah! Panguitch Utah has some of the best rainbow trout fishing and hunting in Utah. We can accommodate everything from single bicyclists to families to large groups such as tour buses, hunting groups, fishing groups, biker groups and more. Learn more about our lodgings and how conveniently we are located in the middle of all the action by browsing through our site.